Contains: 1 x 9g syringe, 15 automix tips. Accessories: 50 applicator brushes (25 large, 25 small), 15 automix tips, 5 angled root canal tips, 2 OptraStick test pack (contains 2 applicators), 1 mixing pad, 1 mixing plate, instructions for use, 4 flowcharts. Contains: 1 x 3g bottle primer A, 1 x 3g bottle primer B.
Mixing tips have a black hub, clear barrel, and green mixer. Contains: 5 automix tips and 5 angled root canal tips. Contains: 1 x 1.7g syringe. 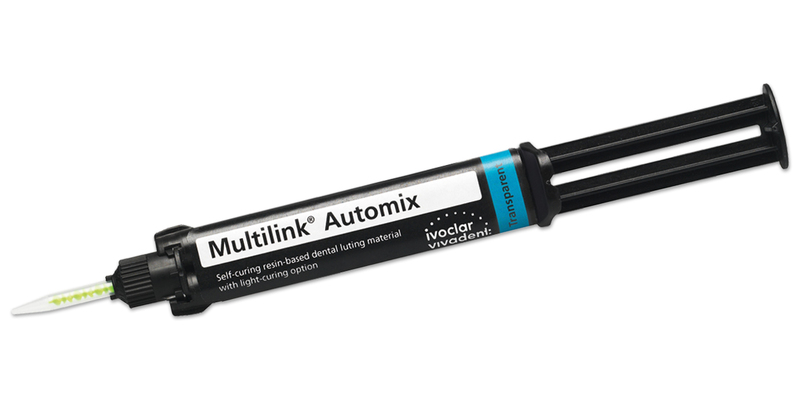 Multilink Automix is a self-cured with optional light-cured adhesive resin cement with a self-curing and self-etching primer. Suggested applications include adhesive cementation of indirect restorations made of all-ceramic (zirconia, aluminum oxide, and glass ceramics), metal, metal-ceramic, and fiber-reinforced composite. The use of Monobond Plus, a universal restorative primer, is recommended to achieve a stronger bond to all types of restorative materials. Multilink Automix is available in 4 shades with different degrees of translucency: transparent (high), yellow (high), white (medium), and opaque (low). Try-in pastes are now available along with an Air Block Liquid Strip to protect the cement line from oxygen exposure during the curing process. 1=poor, 2=fair, 3=good, 4=very good, 5=excellent. Esthetics: Multilink Automix maintained excellent color stability in 100% of restorations placed over the 4-year evaluation period, ensuring optimal esthetics of the restoration. Lack of Sensitivity: Lack of sensitivity was rated excellent. No additional postoperative sensitivity was reported between years three and four. Resistance to Marginal Discoloration: Resistance to marginal discoloration was rated excellent at 4 years. 5 restorations exhibited staining or graying at the margins. The color of nearly 99% of the restorations has been stable with almost no evidence of microleakage. Retention: Retention was rated excellent with an adjusted debond rate of 2.7%. 16 restorations debonded during the past 4 years. These restorations included 10 lithium disilicate restorations; 4 ceramic-veneered zirconia restorations, 1 of which was a 3-unit bridge; and 2 leucite-reinforced restorations. 5 of these restorations debonded with the core in the restoration and 1 restoration had a short preparation. 407 restorations, cemented with Multilink Automix, recalled at 4 years. The restorations continue to exhibit excellent esthetics, excellent lack of postoperative sensitivity, very good resistance to marginal staining and excellent retention. Clinicians feel confident about the longevity of the restorations they cement with this product. Multilink Automix received a 98% clinical performance rating.